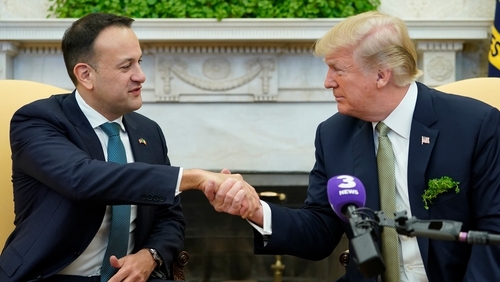 The Government will try to get more American politicians to visit this country following a review of Ireland's relationship with the US. The study that identified the strengths and weakness of the links between the countries went before Cabinet today. It showed that Taoisigh and Ministers have made 169 visits to the US since 2012. It states that this level of engagement should continue but the number of visits to Ireland from US mayors, federal politicians and members of congress could be increased. After the American midterm elections it recommends "aggressive engagement "with the Friends of Ireland caucus in the US Congress to deepen links with newly-elected members. It says too that Irish diplomatic staff in the US should include those with skills in the areas of culture, technology and science. After Brexit the report points out that Ireland will be the only English-speaking country in the EU and it is already extremely close with the US. The review says Ireland play a "bridging role" for better US EU relations. The study also highlights the role of the Irish diaspora in the US.